The PKI 8255 family comes in three versions for the detection of either CO, H2S and O2. All instruments are equipped with a well arranged display providing the most important information. During the development the main focus was laid on a long operating time without need to exchange sensors or battery. Just two buttons allow handling of the unit. Each instrument can be configured via an infrared interface. 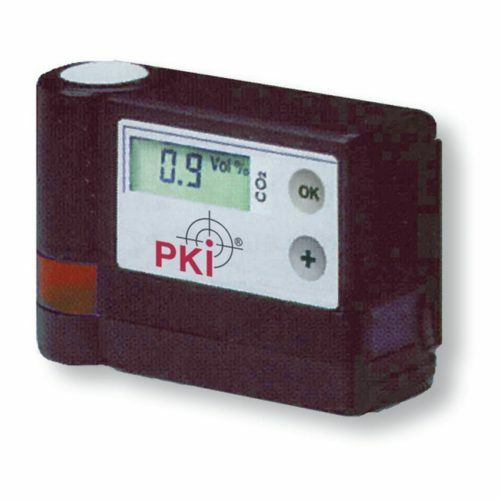 PKI 8255 allows adjustment of several display modes, different alarm limits, measuring units (mg/m3) or a life signal. As a special accessory a helmet holder is available allowing fixation of the device not only at the chest pocket or belt, but also at the helmet. The sensors, installed in the instruments, guarantee a lowest drift, cross-sensitivity and longest service life for operation during a two-years period without calibration. After a 2-year operating period (1 year in case of 0² detection) the user may need to renew the instrument or to receive a reconditioned unit upon return of the used one. This low cost method then allows an operating period of another 2 years. O2 measuring range 25 % by vol.